A PWA that Spawns PWAs, Oh My! TLDR; The ability to build apps with web technology isn't just another way to build the same thing. It enables a whole new category of services that didn't make financial sense previously. As proof, I also introduce a real service that I've built for non-profits called Speedy that generates PWAs on the fly and is built on these ideas. If you've seen any of my writing about PWAs (Progressive Web Apps), you already know that I'm a fan. That is because I believe that the core idea of building ad-hoc, app-like experiences that don't require an install step is transformative to how we use our Fancy Pocket Computer Thingies™️. If you want to get a background on PWAs and why I think they're such a big deal read or watch my "Betting on the Web" post/talk. But, the short version is that The Web has finally gotten "good enough" for making first-class app experiences. I've been happily using the Twitter Lite as my only Twitter client on my phone since it was first launched. I recently I did the same for Instagram, their PWA is coming along nicely and even though it may lack a few features for the time being, I've made the switch. I also recently helped Starbucks build/ship their PWA (U.S.-only for the time being). There are many, many more, examples of companies investing in PWAs. All this to say this isn't theoretical; it's already happening. That's nice Henrik, but users don't care how the app was built! You're absolutely right. Once it's on their device, they don't care whether it's powered by web tech or is running native code for their platform. But, that's actually kind of the point! We can now build the same experience and deliver it in less time than it takes to load the typical boring ol' website. I would argue that users do care about whether or not they have to go install stuff from an app store or not, but I digress. For the purposes of this post let's assume users don't care at all. What this does, however, is change the types of things that make sense for us to build as developers. Let's take an example of a local bike shop. Should they have an app? If we're talking about an app in the traditional sense: absolutely not. There's a very low chance that a bike shop owner could justify dropping $30k+ to a software company to build a custom native app for her. I mean, why would she?! Realistically, unless there's some serious value or incentive she can offer to customers for installing it, they're simply not going to do it. It is extremely unlikely that it investing in custom app development would be a wise investment for her. It could load just as fast as a simple site, but also let her do more. It could show off current inventory, highlight sale items, and maybe let loyal customers track their purchases over time to earn rewards? Or let folks track status of their bike repair. Perhaps there are a few of her most loyal customers who would actually want to add her shop's PWA to their home screens? Or maybe she could have a way to do push notifications about special events, or group rides. For many small businesses, keeping loyal customers engaged and coming back is their life-blood. Therefore, anything that helps them do that is hugely valuable. There are so many use-cases that don't justify the cost of custom software development but could still benefit from a an app-like experience! So what are we supposed to do with this information? Perhaps we can use the inherently dynamic nature of the web to make PWAs for things that previously didn't justify the investment? What I mean is that "bike shop software" can likely be reduced into a fairly constrained and generic set of potential requirements. If she could pay ~$100/mo for a service made for bike shops where she could customize, configure, and publish a PWA that helped her better engage her customers that'd be a no-brainer! There ya go, free business idea: build the ultimate bike shop management tool and make it so each bike shop customer can generate/configure a PWA for their customers. Location-based info, what music is playing, etc. If you build one of these, and make a lot of money I'd gladly accept 1% of your profits 🤓 . I suppose you're right, you could argue it's just a content management system with some industry-specific functionality baked in. But, doing this with PWAs takes it to a different level because it actually makes it relevant to our mobile lives. There's an entire class of problems that could arguably be solved once for a given industry and PWA tech ensures they can integrate into our mobile experiences. This basic idea has intrigued me for a very long time. That is, the concept of using a web app to essentially generate customized apps for everyone in a certain niche. I first built something like this 8 years ago using jQTouch and Django. Site note: Some of you will note that there are people doing this type of thing with native apps, they're sometimes referred to as "templated apps". I would argue, however, that most of these really shouldn't be native apps at all because without the automatic delivery and discovery via the company's website it's not likely that many people will download, install, and actually use these. Ok that's a nice theory, but is it doable? Well, umm… so I did this. I've quietly built a business that does exactly what I've been describing. Don't worry, unless you're involved with a non-profit you're not the target audience. The service has been in private beta for some time, but is now open to public as of last week. It's called Speedy if you're interested you can read more about what it provides here: https://speedy.gift. But, for our purposes in this post, it lets non-profits configure their own PWAs for giving them money online using Apple Pay, Google Pay, or credit cards. The whole thing is optimized for removing barriers to giving with a smartphone. If you're a U.S. based non-profit organization I'm not aware of any faster or easier way to start accepting online donations. It's simply a dynamically generated PWA served on a sub-domain of their choosing (unfortunately, for the time being it's limited to the U.S. for legal reasons). The very first bit of setup for a new organization in Speedy is to pick a sub-domain. From the instant they complete that step they are now the proud owners of a PWA for their organization. 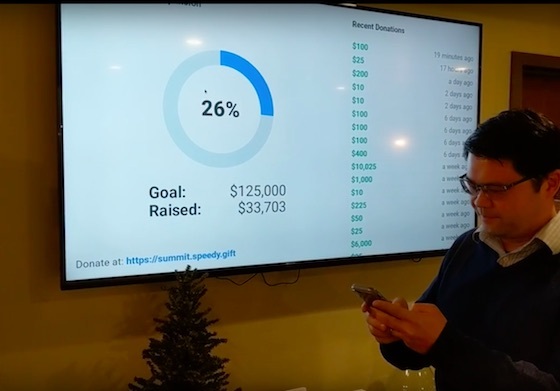 They can literally start to collect donations through their own PWA in less than 5 minutes of setup. This would not even be possible with templated native apps. Also, just to make things interesting, everything in the generated app and the admin itself, for that matter, updates in real-time. This means as you use the admin tool to configure your PWA you can have another device open to your donation app and watch changes being applied to your app as you change them in the admin tool. As anyone donates, all the charts, graphs, and lists in both the donation PWA and the admin site update in real-time. So you configure a PWA with an admin tool? Yep, and obviously, it's a PWA too! I mean, why wouldn't it be?! 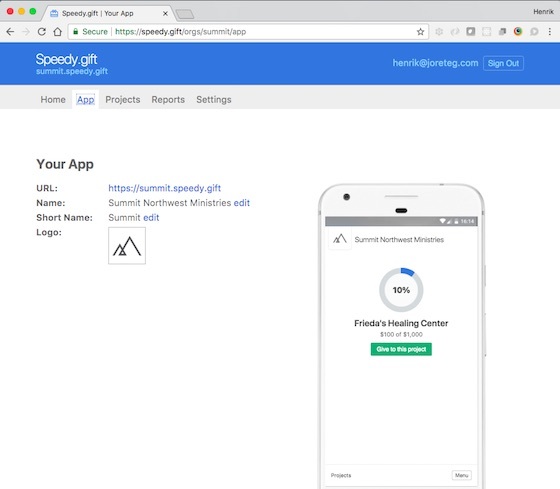 We use an iframe to embed the PWA you're configuring into the admin tool so you can see your changes applied in real-time. There's no need for us to build a preview of the app, instead we just show you the PWA itself inside the other PWA! If you're familiar with PWAs you know that these details are configured using a Web App Manifest which is just a JSON file. So, that part is pretty straightforward to generate on the fly. This is all just silly, Henrik! Maybe. But, is it though?! So far, in a small private beta we've helped a handful or organizations collect over $60,000 in donations through those generated PWAs and the feedback has been overwhelmingly positive from both the orgs and the donors. 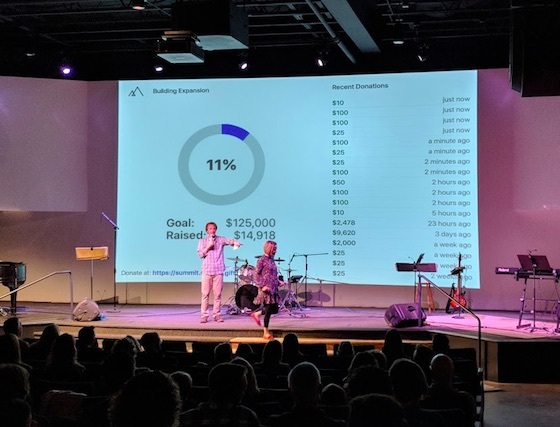 As it turns out, the combination of making it incredibly easy to donate and being able to see progress toward the fundraising goals animate in real-time as donations come in is highly motivating for donors. This view is also just a page on the PWA that includes support for going into full-screen mode. This means it's super simple to put it on a projector or just use an inexpensive Chromecast to show it on a TV. The web is so versatile! Same app can be used on the phone or on a huge projector. Pretty sweet, right?! Anyway, If you're involved with a non-profit you should probably go sign up for Speedy to try it out. But, remember how I said this whole approach enables new business models? Speedy is a case in point. If we were generating native app builds, there's no possible way we could let organizations start with zero up-front costs like we do. Really well, thanks! 😜 If you're a dev you're probably wondering how it's built. There's still a lot I want to do to build on these ideas and techniques. But at this point I've at least proven the core concept to myself. That's why I figured it was time to share it. I'll be blogging more about some of the technical aspects of this stuff in the future and I'm also in the process of writing a second book. The book is about Redux patterns that I've found really helpful in building Speedy and the work I did for Starbucks. Obviously, if you're involved with a non-profit in any way, I'd love to hear your thoughts on Speedy itself. If you have questions or whatnot feel free to email me: henrik@joreteg.com or follow me on Twitter: @HenrikJoreteg.